At St Joseph’s Catholic Primary School we support our parents who wish their children to live a healthy lifestyle. For those parents who wish their children to have a cooked meal at lunchtime, the school can provide a school meal that will provide one third of a pupil’s daily requirement of nutrients. 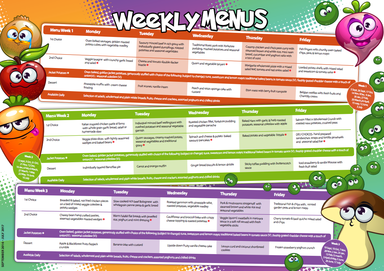 Gateshead Council School Meals Service offers a wide range of healthy options in their nutritionally analysed menus and a team of their catering professionals headed by Mrs Mitchell, our Catering Manager, produce these tasteful meals in school. The meals cost £2.20 each or £11.00 per week and are payable on Mondays. Payments may be made by cash or by cheques made payable to Gateshead Council or preferably by using our on-line payment system. Please click on the link to see the menu. How can my children receive free school meals? If this applies to you, please complete the free school meals application form and return to the address shown. Parents can be sure that pupils who receive a free school meal are not singled out in any way. If you stop receiving one of the qualifying benefits; you stop being responsible for the child/children concerned; or your Tax Credit entitlement changes, you MUST inform the Council’s Benefit Section immediately. Please contact Gateshead Council if you have any queries or require any further information. Please open this link to download an application form for free school meals.